I’m sure you’ve all noticed: NIFTY’s been hitting all-time-highs. And so are several stocks (many of whom we own in our model portfolios). All-time-highs (ATH) are these hated but loved things. If you own a stock, you will love the all time high. If you don’t, the stock will look too expensive. But that’s exactly where the money is: when stocks make continuous all time highs, some one loves that stock. And because they seem to love it and everyone else seem to hate it, it’s probably interesting as a stock to buy. This isn’t universal. Not every stock that makes an ATH is a buy, because it might just be a stock that’s manipulated or has too little volume, or worse, is a fixed income instrument (where all time highs are likely every day). But you could filter these manually. 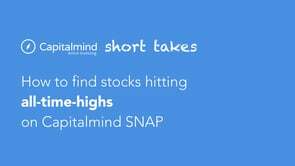 Here’s how you can use Capitalmind Snap to find new stocks hitting all-time-highs. More filtering ideas are also available, such as the number of times a stock has hit an ATH in recent times. You’ll love the fact that this makes it so much easier to discover interesting stocks at inflection points! NOTE: All information presented on Capitalmind’s SNAP platform is to help investors in their decision making process and should not be considered as a recommendation or solicitation of an investment or investment strategy. Investors are solely responsible for their investment decisions and are responsible for validating all the information used to make their investment decision.